It’s that time of year again, and you know the feeling. The itchy, runny, sniffly nose. The headache and the sore throat. The struggle to keep your eyes open even though you got a full night of sleep the night before. You go to bed feeling healthy, but then you wake up the next morning with the sinking realization that you are in a full-blown battle with the dreaded cold. Since I’ve switched from a diet full of processed foods to one that focuses on real foods, I don’t get nearly as many colds as I used to, but whenever I do catch a cold, I don’t reach for the bottle of cold medicine any more. Taking cold medicine used to be my only defense against a cold. I’ve always hated taking it, though. Besides the disgustingly fake cherry and orange flavors and the fact that it always makes me feel like I’m walking around in a daze, it never seems to do much good anyways. Once I discovered the principle, though, of “Let thy food be thy medicine and thy medicine be thy food” (Hippocrates), I realized that I had an arsenal of cold-fighters right in the kitchen. Natural food-based remedies are the ones I reach for now, and they are the only ones that have ever truly helped me to fight off a cold and not just to (poorly) mask a few of the symptoms. Elderberry syrup is a traditional, natural cold and flu-fighter with anti-inflammatory, anti-viral, and immune-enhancing properties. Elderberry syrup works best when it’s taken at the very first sign of a cold coming on. The moment you start to feel a bit out of sorts, take a spoonful of elderberry syrup. Or, even better, take it regularly during the winter as a preventative measure. Drizzle a bit of the syrup onto your pancakes or waffles, or even just enjoy some straight off the spoon. There’s nothing quite so comforting when you have a cold as a bowl of steaming chicken soup. Grandma was right about it being the perfect thing to eat when you’re not feeling well, and she was also right about the broth being the healthiest part! Broth-based soups are very traditional healing foods for illness. Just about every old-fashioned 19th century cookbook that I’ve ever seen includes a chapter or section on cooking for invalids and those who are ill, and the majority of the recipes are simple broth-based soups. Chicken broth is very nourishing and is full of nutrients and minerals. It’s also very easy for the body to digest, which makes it the perfect food for times when your body is fighting off illness. When your body is working so hard to fight off a cold, the last thing you want to do is to overload your digestive system with a rich, heavy, hard to digest meal. The quality of the soup you eat makes a big difference, though, in its healing power. A can of condensed chicken noodle soup, which is most likely full of artificial ingredients, won’t help you nearly as much as a bowl of homemade soup made from real bone broth, pastured meat, and fresh organic vegetables. Add in some herbs like thyme, rosemary, and oregano and you’ve got some pretty powerful medicine! For a recipe idea, try this immune boosting soup recipe from Mary Vance, NC. Garlic fights off more than just vampires. It’s a powerful cold-fighter too. 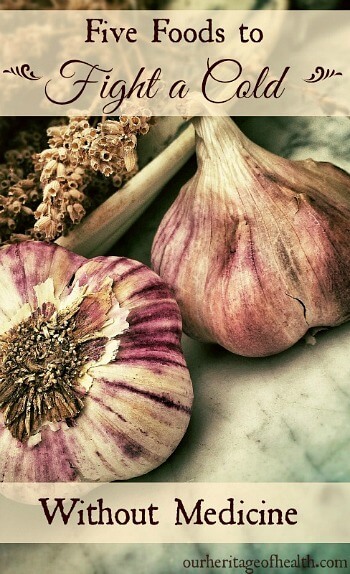 Garlic is antimicrobial, antibacterial, antifungal, anti-just about everything. Garlic “boosts the production of white blood cells, helping to fight off bacteria, parasites, and viruses” and is “effective against many antibiotic-resistant strains of bacteria” (source). 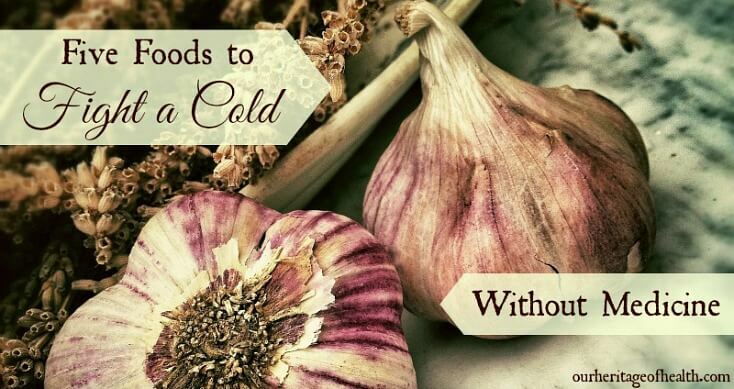 And, according to studies done by the Cochrane Database, garlic is more effective than the flu drug Tamiflu when it comes to shortening the duration of illness (source). Garlic is the most effective when it’s eaten fresh rather than dried or powdered. I wouldn’t recommend chowing down on lots of fresh garlic cloves on an empty stomach, though. I’ve never tried it myself, but I’ve heard many times that raw garlic eaten by itself can cause an upset stomach. Whenever I eat garlic, I just mince some fresh cloves and then add them to my chicken soup or to whatever else I happen to be eating. According to Kami McBride, author of The Herbal Kitchen, another effective way to use garlic is to cut a clove in half and rub it on the bottom of your feet. I’ve never actually tried it, but according to this book, the oils from the garlic will enter your bloodstream through your feet and will give you garlic breath even if you haven’t eaten a single bite! Ginger is another amazing natural remedy that, like garlic, is antibacterial, antifungal, antiviral, anti-inflammatory, etc. Ginger helps to fight colds and the flu, it helps with nausea and motion sickness, it stimulates circulation and digestion, it reduces inflammation, it helps with congestion, and the list of benefits goes on and on. I always try to have either some fresh ginger or some ginger tea on hand for times when I don’t feel well. My favorite way to use ginger when I have a cold is to have a steaming mug of ginger tea sweetened with a bit of honey or maple syrup. It’s warming and delicious, and it’s a much, much better-tasting cold remedy than anything you can find in a drugstore! Cod liver oil is something I take on a regular basis during the winter months, but whenever I feel like I’m coming down with a cold, I make sure to take an extra dose. Old-fashioned, traditional cod liver oil is a great source of omegas and vitamin A, but it’s also a good source of vitamin D. And vitamin D is a very important nutrient for a healthy immune system and for fighting off a cold. Unfortunately, for most of us, cold season happens during the winter months when our bodies aren’t able to make vitamin D from sunshine. Cod liver oil to the rescue! Not all cod liver oil is equal, though. Most types you see in health food stores are likely to be highly processed with synthetic vitamins A and D added in. The cod liver oil I use in an old-fashioned extra virgin cod liver oil that is unrefined so that the natural vitamins and essential fatty acids are still intact. Since it’s not a food, it didn’t make it onto the list, but another cold-fighter that always helps me as much or more than anything else is sleep. Sleep, sleep, and more sleep! I don’t think it’s possible to get too much sleep when you have a cold or when you are trying to fight one off. Having a cold is the perfect excuse to go to bed early, sleep in late, and take as many naps as you want. (And since I’m still trying to focus on sleep for my 30 Day Sleep Challenge, I’m all for getting plenty of sleep right now.) Let your body have all the rest that it needs! 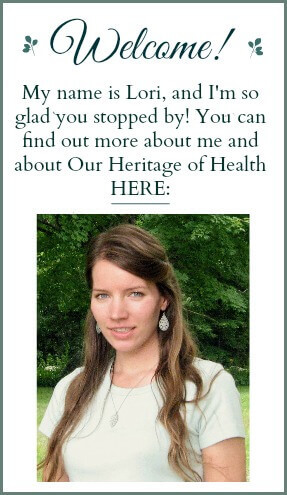 Very informative…..Thank you for sharing with the Clever Chicks Blog Hop this week; I hope you’ll join us again! 1. Sunlight — God gives us this for FREEEEEE…and it is a powerful flu and cold fighter. 2. Virgin coconut oil — I use this daily to stay healthy. Lauric acid in it is great against viruses. Yes! I love those two others! Hola! I’ve been reading your blog for a long time now and finally got the courage to go ahead and give you a shout out from Atascocita Tx!